Whether you have a child that just left for college, or no longer have any use for a room that was previously being used as office space or a personal studio, an idle spare room can drive you crazy. If you find yourself with a spare room in your home, and you don’t know what to do with it, below are four tips for using an under-utilized space. If you have been agonizing over what to do with a spare room for a while now and are at your wit’s end, consider putting the contents of the room into a self-storage unit until you can figure out what to do with it. Make sure the facility you use offers climate controlled storage (especially for things like mattresses and furniture with delicate fabrics and upholstery). Climate controlled storage is especially important if you live in a region of the country that experiences a high amount of humidity, which quickly ruins a great many things, including fabric, organic material, and electronics. If you have a kid that just went off to college, or finally moved out on their own, and you are wondering what to do with their old bedroom, a home office might be useful. It doesn’t have to necessarily be an office dedicated to your business (not everyone has their own business), but simply an area of your home that you dedicate to administrative tasks, computer use, and document storage. A spare room can be an invitation to inject some creativity into your life. If you are a creative person, and you have always wanted a room where you can paint, craft, sculpt, and explore your artistic side, then a spare room could be the perfect home studio. Having a creative space in your own home is something many people find very inspiring. A spare room in your home might simply become your secondary storage area after a while, especially if you really don’t know what else the space could possibly be used for. If your home is already overflowing with stuff and there is nowhere else to store anything, spare rooms often become de facto storage spaces. This can be a recipe for clutter, however, so consider outsourcing that storage to a self storage facility with climate control. A spare room is often an invitation to get creative and add a dimension to your home it didn’t have before. 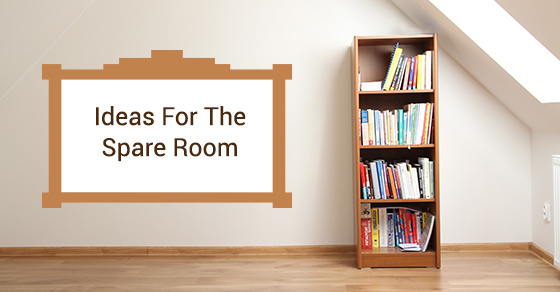 If you are at a loss for what to do with a spare room in your home, keep the above suggestions in mind. Take your time, and store what you need to store while you decide what to do, so you can turn that extra room into another useful space in the home.